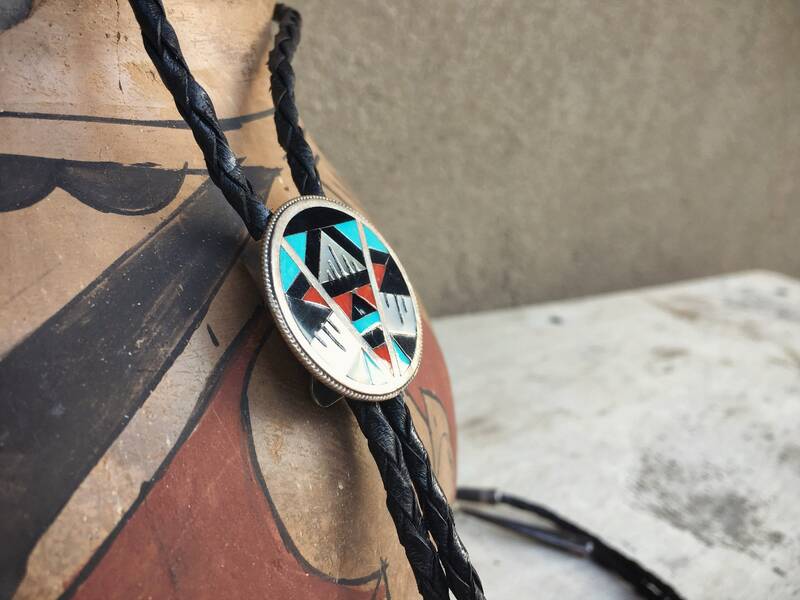 This bolo tie is small yet with great presence. 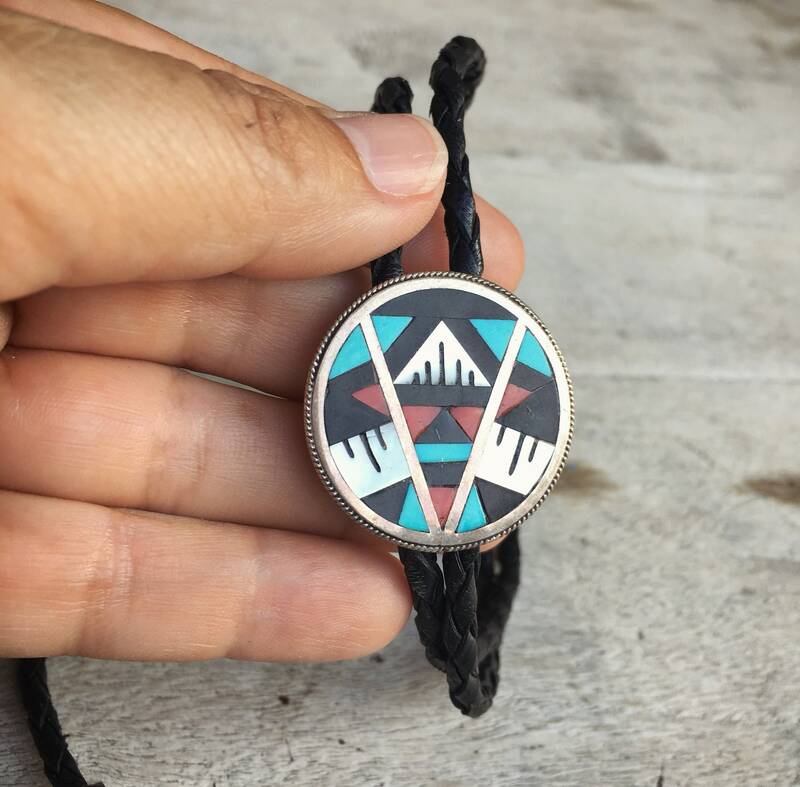 Four stones--turquoise, black onyx, coral, and Mother of Pearl--are all inlaid onto a thin round sterling silver disc, the edge lined with super fine twist wire and the geometric design unusual and striking. I have to imagine that this design has a meaning in Zuni culture. While I don't know what that is, I can tell you that each of the bits of stone were hand cut and placed so that they are flush next to one another, as well as between the V and Circle silver border. I believe the black lines inside the Mother of Pearl were all hand drawn and represent Rain. This piece is likely from the 1970s, possibly a decade earlier. 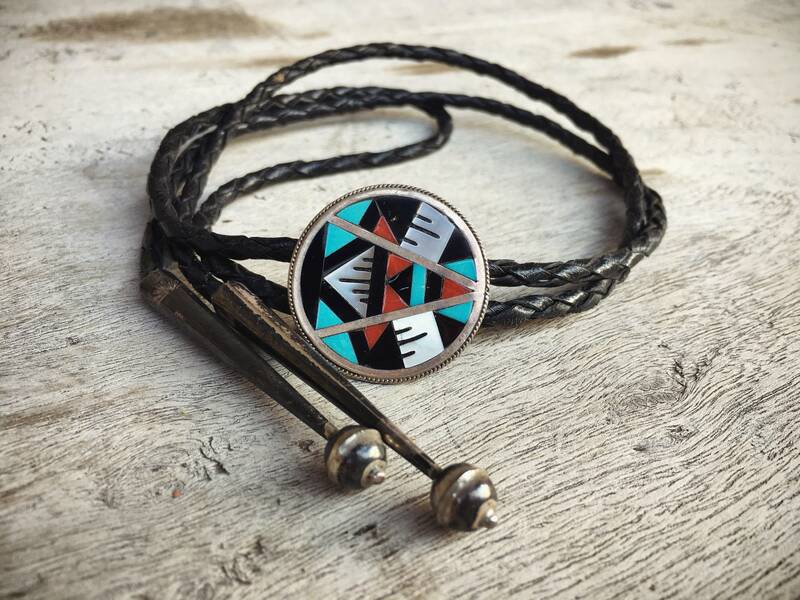 It does carry an artist hallmark, which you can see at the bottom, which appears to be the Sunface for Zuni silversmith duo Sadie and Morris Laahte. symbol. Their works are highly collectible, as they are known for mosaic inlay, which this piece is. They are represented in several galleries, and a sunface bolo not much larger than this one can easily go for $400+. 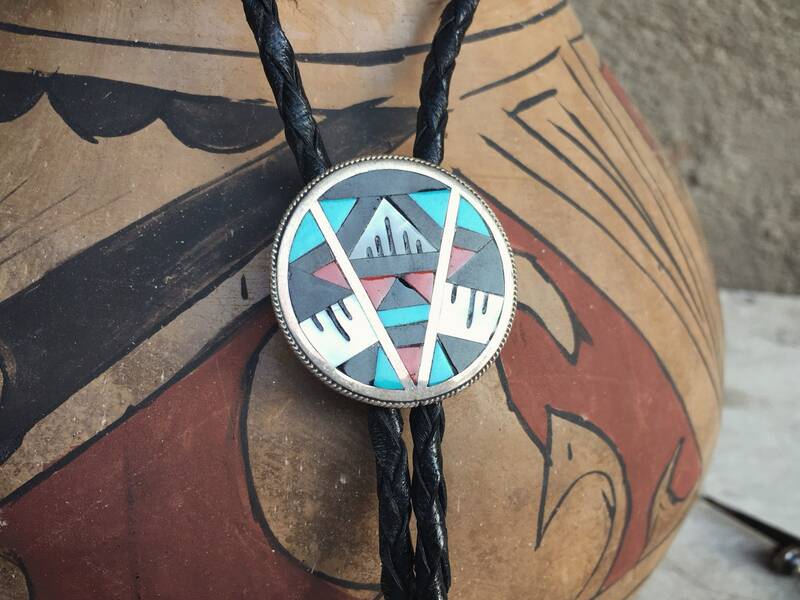 The bolo measures about 1-1/4" in diameter, and the lariat and silver tips are all original. The lariat is quite worn and may need to be replaced at some point. 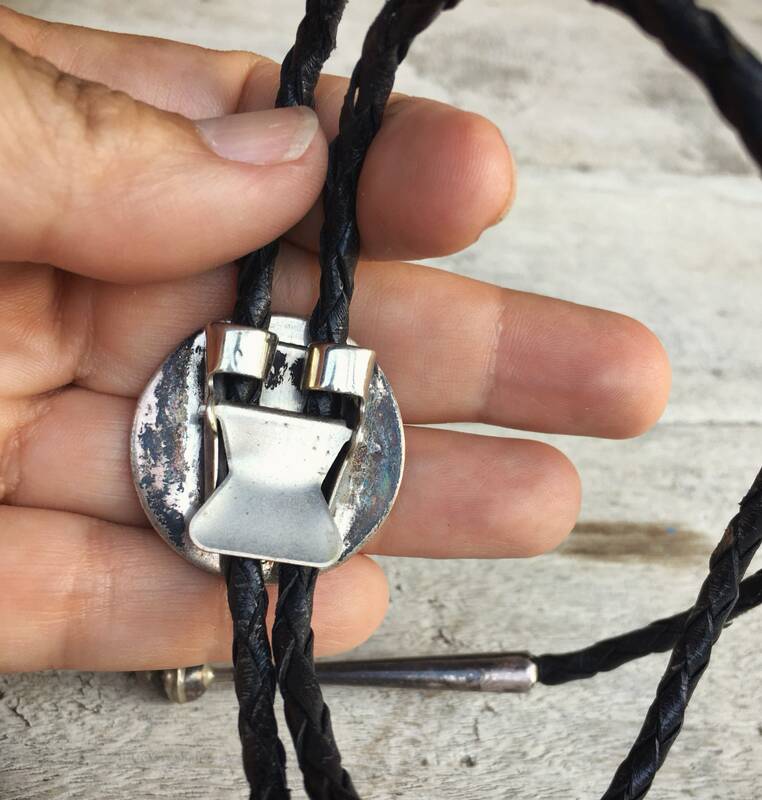 If you would like a new black leather lariat, I can replace this one for $25 additional. Just let me know. The silver is unmarked but the acid test revealed that it is sterling. 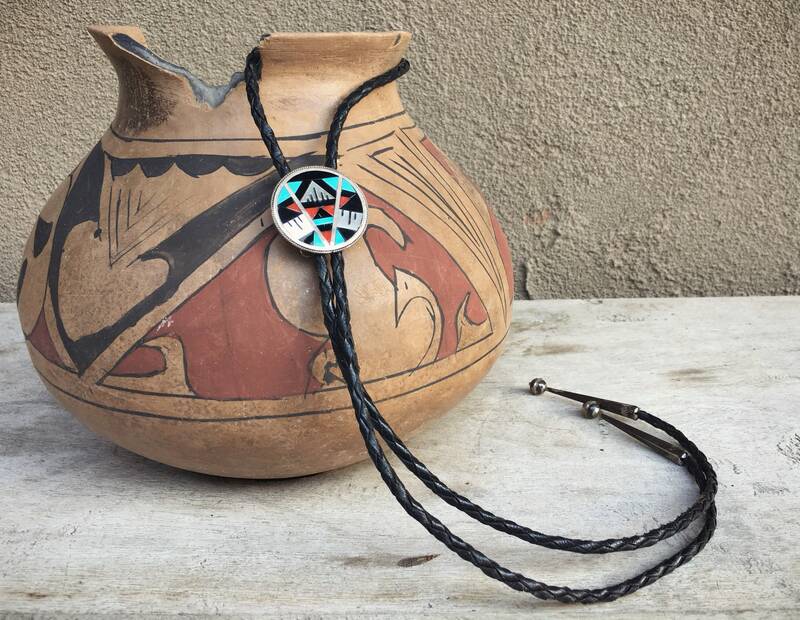 Modernist mosaic bolo by collectible Zuni artists.